After the dust settled from what was the first round of the Western Conference Quarterfinals the four teams that are left standing are the Vancouver Canucks, San Jose Sharks, Detroit Red Wings, and Nashville Predators the 1st, 2nd, 3rd, and 5th seed respectively. Through the first round there was only one team to sweep and show complete dominance over their opponents and that was the Detroit Red Wings over the Phoenix Coyotes. With leadership like Nikolas Lidstrom, grit in Tomas Holmstrom, and jaw dropping skill in Pavel Datsyuk that is a reasonable task. Oh did I mention they did it without Henrik Zetterburg who will be another offensive weapon when he returns to the lineup. They meet up with the San Jose Sharks who had a tough time eliminating the Los Angele Kings in six games, and could have easily been eliminated had the Kings buried a few overtime chances during their series. With offensive skill in Devon Setoguchi, Patrick Marleau, and young emerging talent Logan Couture the Sharks have the guns to give the Red Wings a run for their money. However, where the Sharks fall short and where the series will be decided is in net, a big question mark for the Sharks through the first round, but a strong point for the Red Wings where Jimmy Howard handed the Coyotes with ease. Look for Datsyuk and the heavily offensive Red Wings to chase a Shark goaltender or two out of the net throughout the course of the series. Detroit easily harpoons the Sharks in 5 games. The second match up puts the Vancouver Canucks against the Nashville Predators. Vancouver comin g out of a near tragic first round meltdown where they escaped in OT of game 7 after holding a 3-0 series lead against the Chicago Blackhawks. 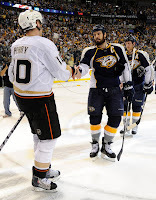 Nashville on the other hand is coming out of a first round series where they eliminated Corry Perry and the Anaheim Ducks in a series full of thrills. This series will be a chess match with little scoring due to great goaltending in Roberto Luongo and the Predators tight defense. With leadership like Shea Webber (and perhaps the best playoff beard ever), and Barry Trotz behind the bench the Predators can very easily make something out of nothing. Their opposition Vancouver will have very little time to refocus after their series with Chicago. When checked tightly the Sedins are very ineffective, just ask Dave Bolland. Look for Jordin TooToo to hit the Sedin twins hard and often to keep them at bay. With all the pressure of being so dominant during the regular season and near first round upset watch for the weight to be too much for the Canucks and come crashing down on top of them, resulting in the Canucks doing what they do best during the playoffs, choke. The Predators will ride the momentum from their first birth into the second round of the playoffs in franchise history past the Canuck and into the Conference finals, Predators in 6.